Imagine a robot hovering overhead as you go about your day, driving to and from work, heading to the grocery store, or stopping by a friend’s house. The robot records your every movement with a surveillance camera and streams the information to a government command center. If you make a wrong move, or even appear to be doing something suspicious, the police will respond quickly and you’ll soon be under arrest. Even if you don’t do anything suspicious, the information of your whereabouts, including what stores and offices you visit, what political rallies you attend, and what people you meet will be recorded, saved and easily accessed at a later date. It is a frightening thought, but you don’t have to imagine this scenario. We are only a few years away from the realization of this total surveillance society. Congress has just passed a bill, the FAA Reauthorization Act, mandating that the Federal Aviation Administration create a comprehensive program for the integration of drone technology into the national air space by 2015. The FAA predicts that there will be 30,000 drones crisscrossing the skies of America by 2020, all part of an industry that could be worth hundreds of millions of dollars per year. This mandate is yet another example of the political power of the military-industrial complex, Congress’ disdain for the privacy of American citizens, and the rampant growth of government. With this single piece of legislation, Congress is opening the floodgates to an entirely new era of surveillance, one in which no person is safe from the prying eyes of the government. This may prove to be the final nail in the Fourth Amendment’s coffin. Attempts to integrate drone technology into the national air space were underway long before Congress put its stamp of approval on the FAA Reauthorization Act. In fact, the FAA authorized 313 certificates for drone operation in 2011, 295 of which were still active at the end of the year, although the agency refuses to say which organizations received the certificates and for what purposes they were used. However, we do know that the FAA had already approved drones for use by the Department of Homeland Security, US Customs and Border Patrol (which uses the drones to conduct surveillance and counternarcotics missions), and certain state and local law enforcement operations. For example, in June 2011, a family of cattle farmers accused of stealing some cows were spied on with a Predator drone before being apprehended by police. The fact that drones—pilotless, remote controlled aircraft that have been used extensively in Iraq, Afghanistan and Pakistan to assassinate suspected terrorists, as well as innocent civilians—are coming home to roost (and fly) in domestic airspace should come as no surprise to those who have been paying attention. The US government has a history of commandeering military technology for use against Americans. We saw this happen with tear gas, tasers, sound cannons and assault vehicles, all of which were first used on the battlefield before being deployed against civilians at home. Thus, while 83% of Americans approve of the use of drones abroad, and 65% approve of using drones to assassinate suspected terrorists abroad, even if they are American citizens, it remains to be seen how those same Americans will feel when they are the ones in the sights of the drones. Needless to say, they won’t have to wait too long to find out. 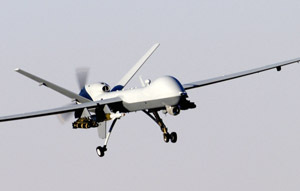 While there are undoubtedly legitimate uses for drone technology, such as locating missing persons, there is no legitimate reason for the government to collect a constant stream of information on the whereabouts of Americans. However, if this drone program is implemented in the way that Congress intends, we will have drones armed with “less-lethal” weaponry, including bean bag guns and tasers, flying over political demonstrations, sporting events, and concert arenas. Eventually, these drones will be armed with the lethal weaponry that is currently being used overseas in Afghanistan and Pakistan. The power of these machines is not to be underestimated. Many are equipped with cameras that provide a live video feed, as well as heat sensors and radar. Some are capable of peering at figures from 20,000 feet up and 25 miles away. They can also keep track of 65 persons of interest at once. Some drones are capable of hijacking Wi-Fi networks and intercepting electronic communications such as text messages. The Army is currently developing drones with facial recognition software, as well as drones that can complete a target-and-kill mission without any human instruction or interaction. They are the ultimate killing and spying machines. In addition to the privacy concerns, the safety of drone technology has been called into question. There have been a handful of high-profile crashes involving American drones abroad, including in Iran, the island nation of Seychelles, and most recently in Somalia. The Iranian government claimed they brought down the drone flying in their territory via a computer hack. This is two years after Iraqis were able to hack into the live feed of a few drones using “$26 off-the-shelf software.” Mind you, back in October 2011, the US military admitted that their drone fleet had been infected by a ‘mysterious virus.’ The faultiness of the drone technology and the fact that amateur hackers can access the controls and camera feeds are reason enough to ground these devices indefinitely. Unfortunately, with the wars abroad winding down, America has become the new battleground in the war on terror, to the delight and profit of the military-industrial complex. In fact, with companies like Boeing and Lockheed Martin making their influence felt among members of Congress (Boeing spent over $12 million lobbying in 2011, and Lockheed spent over $11 million), you can be sure that their technologies will continue to be purchased by the government, even when there is no need for them. Thus, in the same way that our domestic police forces are now armed with mini-tanks and grenade launchers taken from the military’s armory, it was simply a matter of time before drone technology made its way back home. While most Americans are unaware of the electronic concentration camp which is slowly enveloping our society, a select few groups are working to push back against government control. The Electronic Frontier Foundation has filed a lawsuit against the FAA, demanding the records of the drone certificates which the FAA has issued to various agencies, but it is unlikely that the implementation of this technology can be stopped. Based upon the government’s positions on wiretapping, GPS tracking devices, and Internet tracking technologies, it is also unlikely that our elected officials will do anything to protect the American people from the prying eye of the American government. We can sit around waiting for some member of Congress with a conscience or some judge concerned about the coming tyranny to push back against the drone empire from within. However, until the American people succeed in raising their collective voices against this technological tyranny, the powers that be will continue on the path to total control, and the condition of our civil liberties will become more dire with every passing day. Constitutional attorney and author John W. Whitehead is founder and president of The Rutherford Institute. He is the author of The Change Manifesto (Sourcebooks).